Golf in the UK and Ireland has a proud tradition stretching back more than 300 years. Golf of course was invented in the UK and indeed its governing body, the Royal and Ancient Golf Club of St Andrews, is based there. Ireland too has played its part and can boast the oldest national golf union in the world. Today the UK and Ireland has more than 2500 golf clubs ranging between public and corporate owned links and parkland courses. 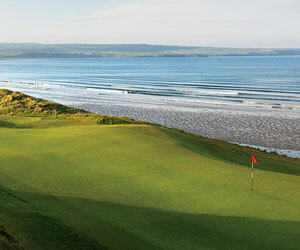 There is little doubt that golf in its purest form, links golf, can only be best experienced in the UK and Ireland. The reputation of courses such as Ballybunion, Royal County Down and St Andrews speaks volumes for European golf around the world. A recent survey has shown that the UK and Ireland has the largest golf population outside of the USA. Of course one must be honest and congratulate the USA for its massive contribution to golf and recognise the fact that it has been the powerhouse of golf since the dawn of the 20th century. But there is the Ryder Cup... ! There is a tremendous variety of golf clubs in the UK and Ireland and the overwhelming majority are maintained to a high standard. In many instances it is the management of the club which makes all the difference. Some are family run, some are municipal , some part of leisure complexes, some former stately homes (sometimes the attitude remains), some private members clubs and others still run as a small business. How does one choose ? Fortunately there is an excellent information resource in the form of Golfeurope's club reviews. Green fees vary considerably but one must be careful not to confuse this with quality. Often there will be a little gem of a course within a few miles of a over-booked, expensive and famous golf club. Perhaps the best advice, especially in Scotland, is to buy a 'golfing passport' which allows one to play several courses at dramatically reduced rates. Most clubs impose few restrictions on visitors but certainly handicap certificates and letters of introduction are advised. Pre-booking is also advised, if not considered etiquette ! There are specialised golf tours operators, sometimes hotels, which specialise in arranging tours and securing bookings at popular clubs. In terms of the UK, our experience has shown Scotland to be the most popular choice for visiting golfers. Its because of good quality and welcoming courses and of course, the tradition. Ireland too is similarly popular but has the added advantage that the country is geographically small thus allowing a full appreciation of Irish golf in a short period of time. The rest of the UK has plenty to offer too. The coastline boasts a wealth of links courses but there is undoubtedly a wider choice of parkland courses, Wentworth and Perton Park to name but two. The character of the different regions throughout UK and Ireland is dictated by the people. The reputation of the Scots and Irish is already well known but suffice is to say that it is warm and welcoming. The Welsh are a proud nation. The English however are a mixed bunch. North to south, east to west, they have markedly different characters. Northerners are arguably more open and welcoming than southerners. The south-east which includes London is a busy and demanding place in which to live and the people there are similarly 'busy'. There is therefore a culture to suit every visitor - but remember our sense of humour. In terms of geography, there are mountain ranges, lakes, moorland, rolling countryside and coastlines. Best of all, this topography is packed into a relatively small area for the visitor to enjoy easily within the duration of the average holiday.